The Sausalito 5 Light Chandelier showcases a sophisticated transitional design. Crafted from hand-forged iron, the Troy Lighting fixture features 5 (60 watt) candelabra lights in a hardback linen shade. A decorative ironwork frame wraps around the chandelier bringing in a European flavor and the silver gold finish adds charm to the equation. Q Do you have this in oil rubbed bronze? A The Troy Lighting Sausalito 5 Light Chandelier F1285SG is not available in Oil Rubbed Bronze, but it is available in Deep Bronze F1285DB. Q Does this have a mini pendant that can hang over a countertop in the silver gold? 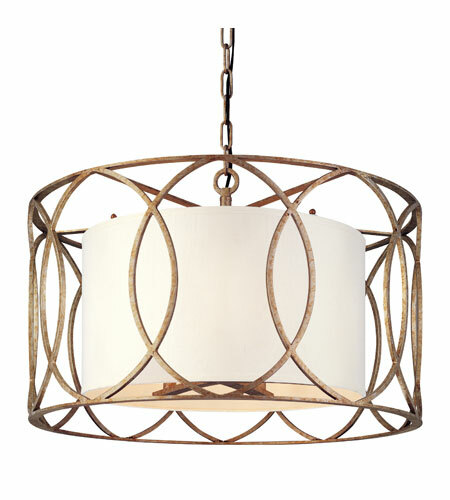 A The Troy Lighting Sausalito 5 Light Chandelier F1285SG is not available as a mini pendant. Q How long is the chain for this chandelier? Our ceiling for our master bedroom is 12 feet. Thnak you. A The Troy Lighting Sausalito 5 Light Chandelier F1285SG comes with 4 ft of chain. Q Does this fixture come in other sizes? A Yes, the Troy Lighting Sausalito 5 Light Chandelier F1285SG is also available as a 3 Light Entry Chandelier F1287SG, a 4 Light Pendant F1284SG and an 8 Light Entry Chandelier F1288SG. Q Does the finish come in silver or nickel? A The Troy Lighting Sausalito 5 Light Chandelier F1285SG is available as this Silver Gold version, or as a Deep Bronze version F1285DB. Q What is the shade made out of? Do you have any pictures in a home? A The Troy Lighting Sausalito 5 Light Chandelier F1285SG shade is a hard back linen shade. Unfortunately, we do not have an alternative image of this fixture in a room. Q The lamp shade is too stark white for my home. Do you sell an alternative shade (preferably in tan) that would fit? For the walls sconces as well? A The Troy Lighting Sausalito 5 Light Chandelier F1285SG is only available with a Hard Back Linen shade.